Henrik Johan Ibsen (March 20, 1828 – May 23, 1906) was a nineteenth-century Norwegian playwright who was largely responsible for the development of modern Realist drama. His works dwelt on the conditions and problems of the middle classes and were a culmination of bourgeois drama that flourished in nineteenth-century Europe. In his later work, he anticipated and influenced twentieth-century playwrights such as John Galsworthy, George Bernard Shaw, and Anton Chekov with his bold break with sentimental, moralistic drama. Ibsen's work examined the realities that lay behind the many façades of everyday life. His fearless treatment of contemporary social issues—the role of religion in modern life, the hypocrisies of family life, the subordinate status of women, and corruption in public affairs—was considered scandalous in his own time. Ibsen's works shattered illusions by presenting characters with flaws and ambiguities, often engaged in settings and actions without a clear moral resolution. His plays helped redefine the role of drama as a medium for the examination of socially relevant issues. His plays demonstrated the spiritual and moral challenges society faced as it became increasingly urban and modern, and the influence of Christianity began to wane. Ibsen remains among the most frequently performed dramatists in the world, after William Shakespeare. 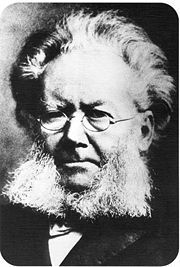 Henrik Ibsen was born to Knud Ibsen and Marichen Altenburg, a relatively well-to-do merchant family, in the small port town of Skien, Norway, which was primarily noted for shipping timber. Shortly after his birth, his family's fortunes took a significant turn for the worse. His mother turned to religion for solace, while his father declined into a severe depression. The characters in his plays often mirror his parents, and his themes often deal with issues of financial difficulty as well as moral conflicts stemming from dark private secrets hidden from society. At 15, Ibsen left home. He moved to the small town of Grimstad to become an apprentice pharmacist and began writing plays. Ibsen came to Christiania (later renamed Oslo) intending to attend university. He soon cast off the idea (his earlier attempts at entering university were blocked as he did not pass all his entrance exams), preferring to commit himself to writing. His first play, the tragedy Catilina (1850), was published under the pseudonym Brynjolf Bjarme, when he was only 22, but it was not performed. His first play to see production, The Burial Mound (1850), received little attention. Still, Ibsen was determined to be a playwright, although he was not to write again for some years. He spent the next several years employed at the Norwegian Theater in Bergen, where he was involved in the production of more than 145 plays as a writer, director, and producer. During this period he did not publish any new plays of his own. Despite Ibsen's failure to achieve success as a playwright, he gained a great deal of practical experience at the Norwegian Theater, experience that was to prove valuable when he resumed writing. Ibsen returned to Christiania in 1858 to become the creative director of Christiania's National Theater. He married Suzannah Thoresen the same year and she soon gave birth to their only child, Sigurd. The couple lived in very poor financial circumstances and Ibsen became very disenchanted with life in Norway. In 1864 he left Christiania, traveling to Italy in self-imposed exile. He was not to return to his native land for the next 27 years. His next play, Brand (1865), was to bring him the critical acclaim he sought, along with a measure of financial success, as was his next play, Peer Gynt (1867), for which Edvard Grieg famously composed the incidental music. With success, Ibsen became more confident and began to introduce more and more of his own beliefs and judgments into the drama, exploring what he termed the "drama of ideas." His next series of plays were written during what has been called his Golden Age, when he entered the height of his power and influence, becoming the center of dramatic controversy across Europe. Ibsen moved from Italy to Dresden, Germany in 1868. There he spent years writing the play he himself regarded as his main work, Emperor and Galilean (1873), dramatizing the life and times of the Roman emperor Julian the Apostate. Although Ibsen himself always looked back on this play as the cornerstone of his works, very few shared his opinion, and his next works would be much more acclaimed. Ibsen moved to Munich in 1875, publishing A Doll's House in 1879. The play is a scathing criticism of the traditional roles of men and women in Victorian marriage. Ibsen followed A Doll's House with Ghosts (1881), another scathing commentary on Victorian morality, in which a widow reveals to her pastor that she has hidden the evils of her marriage for its duration. The pastor had advised her to marry her then fiancé despite his philandering, and she did so in the belief that her love would reform him. But she was not to receive the result she was promised. Her husband's philandering continued right up until his death, resulting in her son's syphilis. In Ibsen's time even the mention of venereal disease was highly controversial; to show that even a person who followed society's ideals of morality had no protection was beyond scandalous. Ghosts is a tragedy in which the tragic heroine has no tragic fault—she does not, for any reason, deserve to suffer as she does. In almost all tragedies prior to Ibsen, there is always a reason given for why the protagonists come to their tragic ends; but in Ghosts this notion is shattered, and the cause of the widow's distress is not any fault of her own, but the very virtuousness which she had practiced, unhappily, for so long. In An Enemy of the People (1882), Ibsen went even further. The protagonist is a doctor, a pillar of the community. The town is a vacation spot whose primary draw is a public bath. The doctor discovers that the water used by the bath is being contaminated when it seeps through the grounds of a local tannery. He expects to be acclaimed for saving the town from the nightmare of infecting visitors with disease, but instead he is declared an "enemy of the people" by the locals, who, fearing the loss of their source of revenue, band against him and even throw stones through his windows. The play ends with his complete ostracism. It is obvious to the reader that disaster is in store for the town as well as for the doctor, due to the community's unwillingness to face reality. The Wild Duck (1884) is considered by many to be Ibsen's finest work, and it is certainly the most complex. It tells the story of Gregers Werle, a young man who returns to his hometown after an extended exile and is reunited with his boyhood friend, Hjalmar Ekdal. Over the course of the play the many secrets that lie behind the Ekdals' apparently happy home are revealed to Gregers, who insists on pursuing the absolute truth, or the "Summons of the Ideal." Among these truths, Gregers learns that his own father impregnated his servant Gina, then married her off to Hjalmar to legitimize the child. Another man has been disgraced and imprisoned for a crime the elder Werle committed. And while Hjalmar spends his days working on a wholly imaginary "invention," his wife is earning the household income. Ibsen, in The Wild Duck, displays masterful use of irony; despite his dogmatic insistence on truth, Gregers never says what he thinks, but only insinuates, and is never understood until the play reaches its climax. Gregers hammers away at Hjalmar through innuendo and coded phrases until he realizes the truth; his daughter, Hedvig, is not his child. Incensed by this, Hjlamar disavows the child, tearing his family apart. Seeing the damage he has wrought, Gregers determines to repair things, and suggests to Hedvig that she sacrifice the wild duck, her wounded pet, to prove her love for Hjalmar. Hedvig, alone among the characters, recognizes that Gregers always speaks in code, and looking for the deeper meaning in the first important statement Gregers makes which does not contain one, kills herself rather than the duck in order to prove her love for him in the ultimate act of self-sacrifice. Interestingly, late in his career Ibsen turned to a more introspective drama that had much less to do with denunciations of Victorian morality. In such later plays as Hedda Gabler (1890) and The Master Builder (1892), Ibsen explores psychological conflicts that transcend a simple rejection of Victorian conventions. Many modern readers, who might regard anti-Victorian didacticism as dated, simplistic, and even clichéd, have found these later works to be of absorbing interest for their hard-edged, objective consideration of interpersonal confrontation. Hedda Gabler and The Master Builder center on female protagonists whose almost demonic energy proves both attractive and destructive for those around them. Hedda Gabler is probably Ibsen's most performed play, with the title role regarded as one of the most challenging and rewarding for an actress even in the present day. Hedda Gabler is Ibsen's masterpiece, famous for the full, astoundingly complex characterization of its title character. The play is often cited as one of the earliest works of psychological drama, and is believed to be a major influence on a number of modernist writers who would adopt a highly psychological style, among them Henry James. First published in 1890, it premiered the following year in Germany to negative reviews. Hedda Gabler has subsequently gained recognition as a classic of Realism . A 1902 production was a major sensation on Broadway, starring Minnie Maddern Fiske. Following its initial limited run, it was revived with the same actress the following year. The character of Hedda is one of the great dramatic roles in theater, often referred to as "the female Hamlet," and some portrayals have been very controversial. Depending on the interpretation, Hedda may be portrayed as an idealistic heroine fighting society, a victim of circumstance, a prototypical feminist, or a manipulative villain. The play has endured so well perhaps because of this very flexibility: by focusing so intently on Hedda Gabler's consciousness, Ibsen created a masterpiece that can be interpreted nearly an endless number of ways. The action takes place in a villa in Christiania. Hedda Gabler, daughter of an impoverished General, has just returned from her honeymoon with Jørgen Tesman, an aspiring young academic—reliable but uninteresting. It becomes clear in the course of the play that she has never loved him, she married him for economic security, and she fears she may be pregnant. The reappearance of her former lover, Ejlert Løvborg, throws their lives into disarray. Løvborg, a writer, is also an alcoholic who has wasted his talent until now. Thanks to a relationship with Hedda's old schoolmate, Thea Elvsted (who has left her husband for him), he shows signs of rehabilitation, and has just completed what he considers to be his masterpiece. This means he now poses a threat to Tesman, as a competitor for the university professorship which Tesman had believed would be his. It became clear earlier that the couple are financially overstretched and Tesman now tells Hedda that he will not be able to afford to have her do a great deal of entertaining or to support her in a lavish lifestyle. Hedda, apparently jealous of Mrs. Elvsted's influence over Ejlert, hopes to come between them. Tesman, returning home from a party, finds the manuscript of Ejlert Løvborg's great work, which the latter has lost while drunk. When Hedda next sees Løvborg, he confesses to her, despairingly, that he has lost the manuscript. Instead of telling him that the manuscript has been found, Hedda encourages him to commit suicide, giving him a pistol. She then burns the manuscript. She tells her husband she has destroyed it to secure their future, so that he, not Løvborg, will become a professor. When the news comes that Løvborg has indeed killed himself, Tesman and Mrs. Elvsted are determined to try to reconstruct his book from what they already know. Hedda is shocked to discover, from the sinister Judge Brack, that Ejlert's death, in a brothel, was messy and probably accidental. Worse, Brack knows where Ejlert got the pistol. This means that he has power over her, which he will use to insinuate himself into the household, and there is a strong implication that he will try to seduce Hedda. Unable to fathom the consequences of what she has done, Hedda goes into another room and shoots herself. Ibsen had completely rewritten the rules of drama with a realism that was to be adopted by Anton Chekhov and others and remains an important part of the theater to this day. From Ibsen forward, challenging assumptions and directly speaking about issues has been considered one of the factors that make a play art rather than mere entertainment. Ibsen returned to Norway in 1891, but it was in many ways not the Norway he had left. Indeed, he had played a major role in the changes that had happened across society. The Victorian Age was on its last legs, to be replaced by the rise of Modernism not only in the theater, but across public life. Ibsen died in Christiania on May 23, 1906 after a series of strokes. When his nurse assured a visitor that he was a little better, Ibsen sputtered "On the contrary" and died. In 2006 the one hundredth anniversary of Ibsen's death was commemorated in Norway and many other countries, and the year dubbed the "Ibsen year" by Norwegian authorities. Digte - only released collection of poetry. Firkins, Ina Ten Eyck. Henrik Ibsen. Retrieved October 3, 2007. Gates, Anita. 'The Death of Little Ibsen': Living in a Doll’s House Located on Sesame Street. Retrieved October 3, 2007. Ibsen.net. Ibsen.net All About Ibsen. Retrieved October 3, 2007. Knickerbocker, Eric. The Prominence of Nora: Familiar is Familial. Retrieved October 3, 2007.
nb.no. The International Ibsen Bibliography. Retrieved October 3, 2007. University of Adelaide. Ibsen, Henrik, 1828–1906. Retrieved October 3, 2007. This page was last modified on 30 March 2014, at 22:45.